This page lists historical novels for young adult readers set in seventeenth-century Europe and North America. In the seventeenth century, people still feared witches. Many innocent people were accused of witchcraft and put to death in both Europe and America. By the end of the century, most people stopped believing in witches. Groups like the Puritans and Quakers pushed for religious reforms. One of the seventeenth century's greatest conflicts was the English Civil War, which led to the beheading of King Charles I and the establishment of a Commonwealth government headed by the strict Puritan Oliver Cromwell. Charles II restored the English monarchy after Cromwell's death in 1658. Europeans migrated to North America in large numbers. Many Dutch and English settlers, including religious dissenters like the Puritans, came to the states now known as New England, while French colonists settled in Canada and the Louisiana territory. (This migration had its beginnings in the late sixteenth century, so some novels set in the sixteenth century are included in the North America sections.) At first, American Indians were mostly friendly to the colonists, but conflicts developed as more and more Europeans took over lands where the Indians had once lived and hunted. Melvin Burgess, Burning Issy (1992), about a twelve-year-old English girl with mysterious abilities who is accused of being a witch. Recommended for grades 5-8. Kathleen Benner Duble, Quest (2008), about seafaring explorer Henry Hudson's son John, one of his shipmates, his girlfriend, and his younger brother. Julie Hearn, The Minister's Daughter (2005), about a minister's daughter in 1645 England who accuses a midwife of witchcraft after she becomes pregnant and the midwife refuses to help her end the pregnancy. BBYA. Recommended for ages 12 and up. Mary Hooper, At the Sign of the Sugared Plum (2003), about a girl who comes to London in 1665 to help her sister run a shop, but arrives as a plague epidemic begins. Recommended for grades 5-8. Mary Hooper, Petals in the Ashes (2004), about a girl who returns to London to help run her sister's shop just before the devastating Great Fire in 1666; sequel to At the Sign of the Sugared Plum. Recommended for ages 12 and up. Mary Hooper, The Remarkable Life and Times of Eliza Rose (2006), about a girl who is befriended by the Charles II's mistress Nell Gwynn after being thrown in prison for stealing something to eat. Mary Hooper, Newes from the Dead (2008), based on the true story of Anne Green, a London maidservant who was hanged in 1650, but revived just as doctors at the Oxford Medical School were about to begin dissecting her body. Sherryl Jordan, The Freedom Merchants (2013), about a boy from Ireland who, when his brother is captured by Barbary pirates in 1615, joins a group of monks to search for his brother and redeem him from slavery. Livi Michael, Malkin Child (2012), about a nine-year-old girl caught up in the Pendle Hill witchcraft trials in Lancashire County, England, in 1612; based on real events. Katherine Sturtevant, At the Sign of the Star (2000), about the twelve-year-old daughter of a London bookseller and her rivalry with her new stepmother. Recommended for ages 9-12. Katherine Sturtevant, A True and Faithful Narrative (2006), about a sixteen-year-old London girl who takes up the unladylike activity of writing and is horrified when a friend of her brother's is kidnapped by pirates. BBYA. Katherine Sturtevant, The Brother's Story (2009), about a teenage boy who abandons his simple-minded twin brother during the winter of the Great Frost to go to London and become an artist's apprentice. Rosemary Sutcliff, Simon (1953), about two childhood friends who fight on opposite sides in the English Civil War. Ann Turnbull, No Shame, No Fear (2004), about a Quaker girl and a boy whose family worships in the Church of England, who must hide their love during a time when the government is persecuting Quakers. BBYA. Recommended for ages 12 and up. Ann Turnbull, Forged in the Fire (2007), about a boy cast out by his father for becoming a Quaker who travels to London in the time just before the Great Fire of London, while the girl he loves waits for him to return so they can be married; sequel to No Shame, No Fear. Ann Turnbull, Alice in Love and War (2009), about a sixteen-year-old girl who falls in love with a young soldier and runs away with him during the English Civil War. Jeanette Winterson, The Battle of the Sun (2009), about a thirteen-year-old boy kidnapped by an evil magician who plans to use him as the final ingredient in his plans to overthrow the Queen of England. William Wise, Nell of Branford Hall (1999), about a thirteen-year-old girl whose plague-stricken village closes itself off to the outside world to prevent the disease from spreading. Lynn Cullen, I Am Rembrandt's Daughter (2007), about Cornelia van Rijn, daughter of the famous artist Rembrandt, who finds herself drawn to two very different young men while she cares for her ailing, mentally failing father alone after her mother dies and her brother marries. BBYA. Jennifer Armstrong, Bridie of the Wild Rose Inn (1994), about a sixteen-year-old girl who leaves Scotland in 1695 to join her parents in Marblehead, Massachusetts, where they are running an inn; #1 in the Wild Rose Inn series. Recommended for grades 7-10. Jennifer Armstrong, Ann of the Wild Rose Inn (1994), about a girl committed to the American patriot cause in 1774 who helps her parents run an inn in Marblehead, Massachusetts; #2 in the Wild Rose Inn series. Recommended for grades 7-10. Jennifer Armstrong, Emily of The Wild Rose Inn (1994), about a girl in 1858 who helps her family run an inn in Marblehead, Massachusetts, when her adopted black sister falls in love with a family staying at the inn; #3 in the Wild Rose Inn series. Recommended for grades 7-10. Jennifer Armstrong, Laura of The Wild Rose Inn (1994), about a girl in 1898 who wishes her parents would update the way they run the 200-year-old family inn in Marblehead, Massachusetts; #4 in the Wild Rose Inn series. Recommended for grades 7-10. Jennifer Armstrong, Claire of the Wild Rose Inn (1994), about a girl who helps to run her family inn in Marblehead, Massachusetts, and disagrees with her brother's proposal to turn it into a speakeasy during the Prohibition years; #5 in the Wild Rose Inn series. Recommended for grades 7-10. Jennifer Armstrong, Grace of the Wild Rose Inn (1994), about a girl who helps her family run an inn in Marblehead, Massachusetts, while she waits for her fiancé to return from fighting in World War II; #6 in the Wild Rose Inn series. Recommended for grades 7-10. Elisa Carbone, Blood on the River (2006), about a twelve-year-old London boy who serves as the page to Captain John Smith in the Jamestown settlement. Julie Chibbaro, Redemption (2004), about a twelve-year-old English girl who flees to the New World with her mother to try to join her father after they are persecuted for following a man who is working for religious reforms. Recommended for ages 12 and up. Karen M. Coombs, Sarah on Her Own (1996), about an orphaned fourteen-year-old girl who finds herself alone in Colonial Virginia in 1621 after her aunt dies aboard the ship bringing them to America. Jane Louise Curry, A Stolen Life (1999), about a thirteen-year-old Scottish girl who dresses as a boy to escape prison and is kidnapped and sent to become an indentured servant in America. Recommended for ages 12-14. Sharon Draper, Copper Sun (2006), about a fifteen-year-old African girl kidnapped from her village and taken on a slave ship to America, where a plantation owner gives her to his son as a birthday present. Joan Elizabeth Goodman, Paradise (2002), about a sixteen-year-old French girl who joins her uncle's 1542 expedition to Canada, but is sent to a harsh island, instead, with the forbidden lover she smuggled onto the ship. Lynne Kositsky, Claire by Moonlight (2005), about an Acadian girl living in Nova Scotia in 1755 when British soldiers force the Acadians to leave their land. Gladys Malvern, Jonica's Island (1945), about a girl in 1660 New Amsterdam who becomes an indentured servant after her father is banished from the community. Gladys Malvern, Wilderness Island (1961), set in New Amsterdam. Gladys Malvern, Eric's Girls (1949), about two sisters who come to New Amsterdam with their father and find romance, one with an English lord, the other with a Dutch boy. Gladys Malvern, Meg's Fortune (1950), about a fifteen-year-old girl who sails to America with her parents on the Mayflower. Elizabeth Massiem, 1609: Winter of the Dead: A Novel of the Founding of Jamestown (2000), about two boys who travel to America with John Smith and must endure a harsh winter and the brutality of the settlers in the doomed Jamestown Colony. Joseph Bruchac, Pocahontas (2005), about the eleven-year-old daughter of the Indian chief Powhatan and the role she plays in bringing about a more peaceful relationship between her tribe and the European settlers who come to Virginia; recommended for ages 12 and up. Caroline Cooney, The Ransom of Mercy Carter (2002), about a girl who becomes separated from her family during an Indian attack and forced to walk 300 miles north into Canada where she is adopted by an Indian family. Recommended for ages 12 and up. Susan Cooper, Ghost Hawk (2013), about a Pilgrim boy and a Wampanoag boy whose friendship puts them in danger. Recommended for ages 10-14. Pauline Francis, A World Away (2008), about an American Indian girl taken to England for an exhibition after her village burns. Ellen Howard, The Crimson Cap (2009), about an eleven-year-old boy who travels with LaSalle's last expedition in search of the Mississippi River and is rescued by Indians after other expedition members are killed. Recommended for ages 9-12. Paul Samuel Jacobs, James Printer: A Novel of Rebellion (1997), about an eleven-year-old printer's son and his Nipmuck Indian friend in 1675 when King Philip's War breaks out between the Indians and settlers in Massachusetts. Sally M. Keehn, I Am Regina (2001), about a Pennsylvania girl taken captive by Indians after they attack her family's homestead, killing all the rest of her family, except for her mother, who was away. Recommended for ages 9-12. Katherine Kirkpatrick, Trouble’s Daughter: The Story of Susanna Hutchinson, Indian Captive (1998), about Susanna Hutchinson (the youngest daughter of Puritan exile Anne Hutchinson) who lives with the Lenape by Indians from the age of nine to fourteen, when she learns to her dismay that her brother has ransomed her and she will have to return to life in the colonies. Recommended for ages 9-12. Jackie French Koller, The Primrose Way (1992), about a sixteen-year-old Puritan girl who falls in love with a medicine man in the nearby Pawtucket Indian village. Recommended for ages 12 and up. Kathleen Kudlinski, My Lady Pocahontas (2006), about a friend of Pocahontas. Recommended for ages 9-12. Sonia Levitin, Roanoke: A Novel of the Lost Colony (1973), about a sixteen-year-old boy in the Roanoke Colony in Virginia who falls in love with a Native American girl. Recommended for grades 7-12. Winifred Bruce Luhrman, Only Brave Tomorrows (1989), about a fifteen-year-old English girl who settles in Massachusetts at the time of an Indian uprising. Recommended for grades 5-9. Elizabeth George Speare, The Sign of the Beaver (1983), about a thirteen-year-old boy left to guard his family's homestead alone, who is rescued by Native Americans after being stung by a hive of bees. SOA. Recommended for ages 9-12. M.L. Stainer, The Lyon's Roar (1997), about a fourteen-year-old girl who emigrates with her family in 1587 to the Roanoke Colony, which becomes stranded without supplies from England in 1587; #1 in the Lyon Saga series. Recommended for ages 9-12. M.L. Stainer, The Lyon's Cub (1998), about a fifteen-year-old girl in love with a young Indian brave; #2 in the Lyon Saga series. M.L. Stainer, The Lyon's Pride (1998), about a seventeen-year-old girl who agrees to serve as guide for a group of Roanoke colonists trying to find another group of English settlers on the mainland; #3 in the Lyon Saga series. M.L. Stainer, The Lyon's Throne (1998), about a young wife taken captive by pirates along with her Indian husband and their child; #4 in the Lyon Saga series. M.L. Stainer, The Lyon's Crown (1998), about three half-Indian children sent to the Jamestown Colony in 1612 to escape an epidemic; #5 in the Lyon Saga series. Maxine Trottier, Sister to the Wolf (2008), about a Quebec girl who defies custom to buy an Indian slave's freedom. Kathleen Benner Duble, The Sacrifice (2007), about a ten-year-old girl in Andover, Massachusetts, whose life is thrown into turmoil when two girls from Salem make accusations of witchcraft against people in Andover. 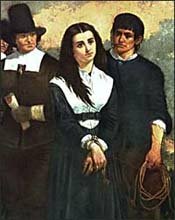 Kathryn Lasky, Beyond the Burning Time (1994), about a twelve-year-old girl in 1691 Salem, Massachusetts, whose mother is accused of witchcraft. Recommended for grades 5-9. Anna Myers, Time of the Witches (2009), about an orphaned girl who goes to live with the rather odd Putnam family in Salem, Massachusetts, just before the witch craze begins. Recommended for ages 12 and up. Ann Petry, Tituba of Salem Village (1964), about a woman from Barbados who is enslaved and brought to Salem, Massachusetts, where she is accused of practicing witchcraft. Celia Rees, Witch Child (2001), a novel written in the form of a journal by a fourteen-year-old girl who immigrates from England to a Puritan community near Salem, Massachusetts, and confesses to being a witch. Recommended for grades 7-10. Celia Rees, Sorceress (2001), about a modern Native American girl who experiences a vision of a life 400 years in the past as an English settler accused of being a witch; sequel to Witch Child. Ann Rinaldi, A Break With Charity (2003), about a girl longing to join the popular circle of girls who meet at the parsonage, who must decide whether to speak up or keep silent when the girls begin accusing local women of witchcraft. Recommended for ages 12 and up.